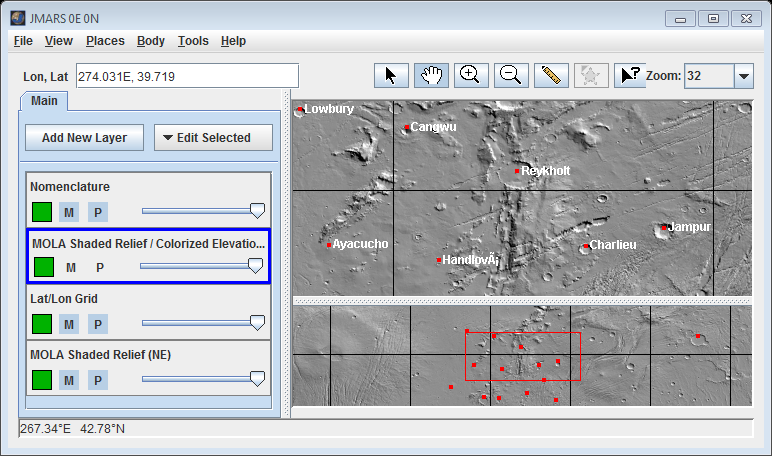 The Nomenclature Layer displays the names and locations of all the named features on Mars. This data has been provided by the U.S. Geological Survey's Astrogeology Research Program. The Nomenclature Layer is available in all JMARS releases. 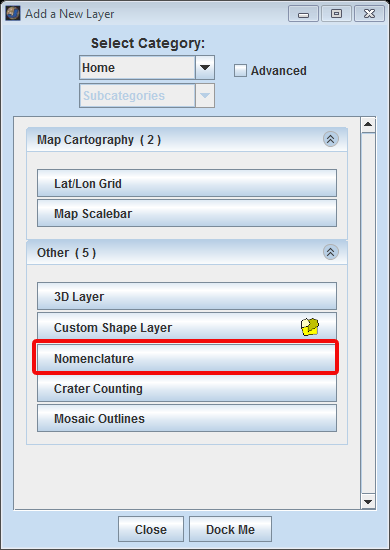 The Nomenclature Layer will open with its default settings, which will probably need to be changed in order to see the features you are interested in. 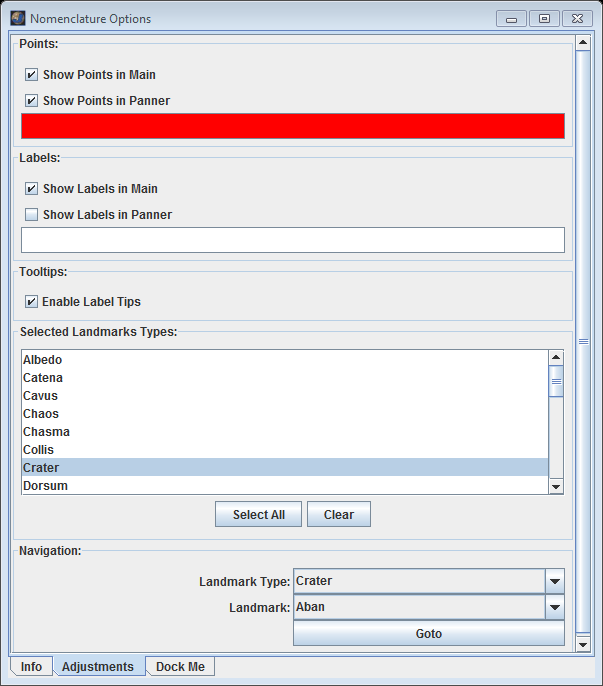 Display Points: On the Nomenclature Layer's focus panel in the "Points" section , check whether the feature points should be displayed in the Main View, Panning View or both. Select Point Color: The default color of the points is red, but if a colorized map is being used a different color may be more visible. Click on the red box to select a different color. Display Labels: Under the Labels section, check whether the feature name labels should be displayed in the Main View, Panning View or both. Display Label Tooltips: With the tooltips enabled, mousing-over the feature names will provide the feature name, feature type, coordinates and the meaning of the name in a mouse tooltip box. Select Landmark Type: Highlighting a type of feature in the scroll list in the "Selected Landmark Types" section will only display that type of feature in the Viewing Window. 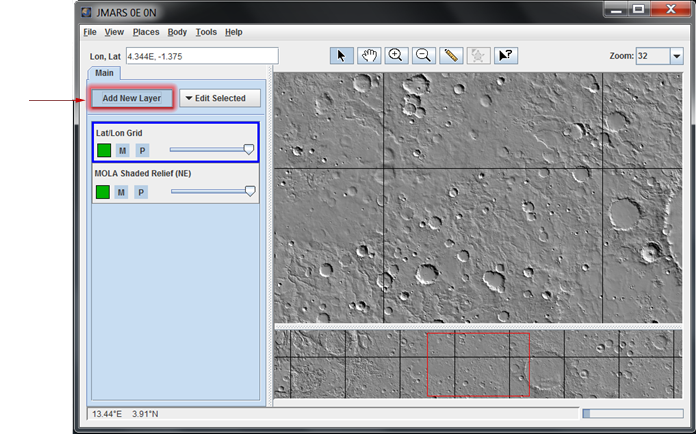 Users can display all the feature types by clicking the "Select All" button. A glossary of the landmark types is available below. Select Landmark Type: In the "Navigation" section of the focus panel, chose a type of feature from the "Landmark Type" drop-down menu. Select Landmark: Select a specific landmark from under the "Landmark" drop-down menu. The options in this menu will change depending on what "Landmark Type" was chosen. Locate Landmark: Click the "Goto" button, which will recenter the Viewing Window on the specified landmark. These features are created by variations in the amount of sunlight reflected by the Martian surface due to surface material. A perfectly white surface would have an albedo of 1.0 while a perfectly black surface would have an albedo of 0. These were the only features that early astronomers were able to identify on the surface of Mars. A linear string of craters produced by a series of impacts, usually caused by a single object (meteor, asteroid, comet, etc) that broke apart shortly before impact, much like Comet Shoemaker-Levy 9 did before it hit Jupiter. Alternately, it can be a string of circular collapse pits in a subsurface lava tube that merely resembles a string of craters. The context is usually sufficient to determine how a particular catena formed. A crater-like, irregularly shaped depression that was not created by an impact. An area of jumbled or hummocky terrain that is thought to be the result of a sudden release of subsurface water, which then caused the terrain above it to collapse in an irregular pattern. A large canyon, depression or trough with steep sides. A small hill or knoll. A group is referred to as a colles. A circular depression created by an impact. Newer impacts are often surrounded by an ejecta blanket. Craters can be sub-divided into: simple, complex, central peak basin, peak ring basin, multi-ring basin and rampart craters. An elongated elevated feature (longer than it is wide) similar to a ridge on Earth. A flow-like feature. Only one such example exists on Mars - Galaxias Fluctus. The term was originally used to describe features on Jupiter's moon Io that look like flowing terrain. In Latin, fluctus means either "wave" or "billow". A long narrow linear depression that was is likely the result of faulting. On Mars, fossa often occur in groups which are referred to as "fossae". Features that are likely the result of a landslide. They usually appear as lobed deposits flowing from some common source. An area of intersecting linear depressions, canyons or valleys. The class example on Mars is Noctis Labyrinthus. An elevated area with a flat top and steep sides, similar to mesas in the American southwest. A large, geographically-isolated mountain, as opposed to a chain of mountains (Montes). Most examples on Mars are volcanic in origin. A comples or irregularly shaped crater with low-relief, scalloped edges and radiating channel-like features. Most are though to be volcanic in origin and similar to low shield volcanoes on Earth. A plain whose area is at a lower elevation than the surrounding terrain. A relatively smooth and flat area that is higher than the surrounding terrain, similar to a plateau on Earth. A cliff or scarp that is straight and linear rather than sinuous. A cliff or scarp that is irregular or lobate in appearance. A feature that resembles a furrow or wrinkle, often found in groups referred to as "sulci". An extended region or landmass, often used in referrence to parts of the southern highlands. An isolated, dome-shape small mountain or hill thought to be volcanic in origin. An area of sand dunes that are very wave-like in appearance. A sinuous valley or canyon, usually fluvial in origin. A large lowland plain. The only example on Mars is Vastitas Borealis, which surrounds the north polar cap.